Community Health Network is a proud partner of the Experience Innovation Network, part of Vocera, and user of Vocera clinical communication solutions. Like Vocera, they are committed to the quadruple aim of improving patient care, safety, and experience, and fostering caregiver resiliency. It’s the close of a three-hour event for team members of Community Health Network (CHNw). Headquartered in Indianapolis, CHNw is an integrated health system with nine hospitals, over 200 sites of care, and about 16,000 caregivers serving the communities of central Indiana. Various CHNw leaders have spoken to the audience of thousands about the importance of the organization’s mission and the focus on “unity.” And now, a woman named Cindy rises from a chair and steps across the stage to give a hug to Bryan Mills, President and CEO of CHNw. As her story unfolds, the audience realizes just how miraculous those steps across the stage are. Not long ago, Cindy suffered a stroke that left her paralyzed and unable to speak. After days in the ICU, she struggled to sit up in a chair unaided. Grunting to communicate affirmatively was an unexpected accomplishment. But here she is, walking and talking. Among the audience are Cindy’s team of CHNw caregivers and all those who support their caring mission. Together, they saved Cindy from a life of dependence and institutionalization. The mutual awe and respect between the patient and her care team is palpable and transcendent. The audience rises to its feet for a standing ovation for Cindy. By having risen to her own feet, she exemplifies CHNw team members’ mission and purpose. Community Health Network was founded after ordinary citizens went door to door in the 1950s, collecting nickels and dimes and scraping together enough money to build the network’s first hospital, Community Hospital East. The network has grown substantially since then, but its focus on the community it serves is unwavering. When a school nurse program was faltering in Indianapolis school districts, CHNw went into schools and carried the school nurse service forward. “We funded it ourselves because it was the right thing to do,” said Mr. Mills. The decision allowed 89,000 students to receive vital support – and it has also paid dividends to the system. Referrals to CHNw from the school districts, generated from goodwill earned as a result of taking responsibility for the school nurse services, have taken off. “When we give back to our community, people understand we are doing that from our heart,” said Mr. Mills. And that generates loyalty. CHNw has also decided to rebuild its original hospital. It will open in 2019 on the same site where Community Hospital East was first built, in a challenging area of Indianapolis that other providers have left behind. “This is about the lives we touch; this isn’t about the lives we treat,” said Mr. Mills. Some healthcare executives might think that being the only provider in the area means CHNw takes all of the risk. The CHNw team thinks differently. They believe that if they show a financially viable path to care for the community, then others will step up too. CHNw’s commitment to community is firmly embraced by its leadership team. 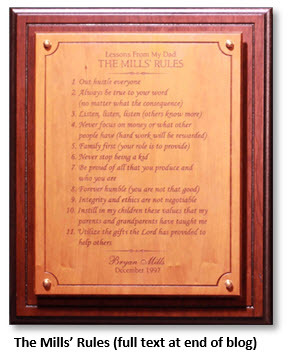 “I lead with the mission first, not the financials,” said Mr. Mills. An accountant by background, Mr. Mills understands the ins and outs of a balance sheet. But he also understands that success as a community health system stems from a deeper commitment. When he began his role as system leader, he spent weeks visiting with doctors, nurses, and care team members on the front line. There he learned about the calling and sense of purpose that care team members feel about their work. He vowed to support that commitment. CHNw’s model centers on a commitment to the vision of Exceptional Care, Simply Delivered to its patients, and a sense of unity and celebration for its workforce of 16,000. Leaders provide direction, and they do so by nurturing the needs of employees and patients and investing time outside of the health system. Rather than falling back on the adage “no margin, no mission,” CHNw’s leaders have explicit orders to ensure their endeavors are mission-oriented. 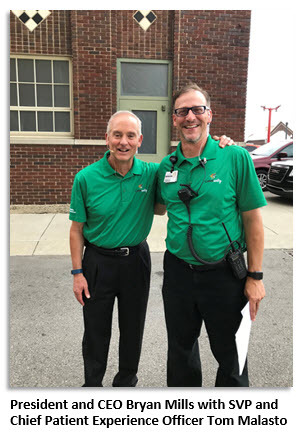 While CHNw’s leaders do not lead blindly with their hearts, chief among their leadership fundamentals are humility and a strong sense of connection to the community. In 2016, Mr. Mills listened carefully to one of his leaders, Tom Malasto, SVP and Chief Patient Experience Officer. As a result, he gave him the green light to create CHNw’s first All-Team Experience, an event that was repeated this month. The purpose of the event is twofold: To get all employees under one roof to receive updates about CHNw’s direction. And, more importantly, to give leaders a forum in which to thank them, appreciate them, serve them, inspire them, and celebrate them. Hundreds of leaders in management positions serve at this event. Donning green polo shirts, they greet employees, serve them water and snacks, and staff booths designed to restore, nourish, and unify them. “The ‘Unity’ in Community” was this year’s theme. When other leaders such as EVP and Chief Nursing Officer Jean Putnam speak at the All-Team Experience, they do so to tell the stories of CHNw’s patients and caregivers, not to shine a light on their own accomplishments as leaders. That’s the attitude and focus that led to Cindy’s miraculous walk across the stage, and a chance for all to revel in what they are able to accomplish together, one person at a time. 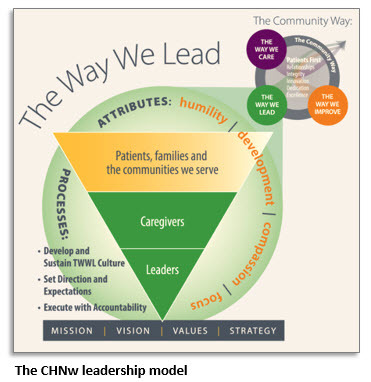 CHNw’s outcomes in almost every domain have been extraordinary for the last few years. While they have a lot to celebrate and be grateful for, it is with humility. There is no I, there is only unity in achieving their goals. Outcomes, particularly the financial ones, are secondary to the mission of serving the community. Still, CHNw is in the middle of its third-best financial year in its 60-year history, with exceptional quality and high rankings in its patient and caregiver experience metrics. Watch this short video to see the power and emotion of the 2018 All-Team Experience.